On September 21, when people in Armenia marked the 23rd anniversary of their independence, one day after the completion of a large Armenia-Diaspora forum in Yerevan that discussed the events in the run-up to the commemoration of the 100th anniversary of the Armenian Genocide, in Deir ez-Zor, Syria, Islamic State (ISIS) militants mined and blew up the Armenian Holy Martyrs Church. The church commemorated the victims of the Ottoman-era Armenian Genocide in a part of Syria where countless Armenians were sent to die in death marches. The blowing-up of the church was perceived in the Armenian world and beyond as a sign that Turkey and the forces supporting it are going to respond to the just claims of Armenians that gather momentum ahead of the centennial of the 1915 Genocide. At the Armenia-Diaspora forum in Yerevan Catholicos of the Great House of Cilicia Aram I said that the Church is going to apply to the Constitutional Court of Turkey with a suit for the recovery of the huge property of the Armenian Church, in particular, the residence of the Catholicos of Cilicia in Sis. 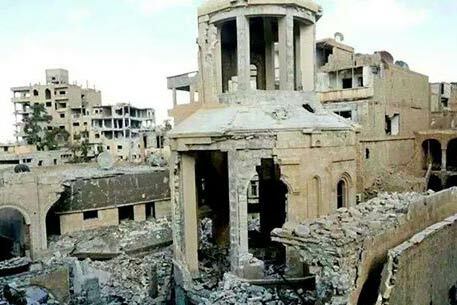 This property was confiscated by Turkey as a result of the extermination and expulsion of Armenians at the beginning of last century, and now, 100 years after those events, the Armenian Church intends to recover what it lost then. Literally on the same day Islamists blew up the church in Deir ez-Zor. According to many Armenian political analysts, Turkey is behind the attack as it tries to demonstrate that it will respond to the claims of Armenians with terror. On his Facebook account Aram condemned the explosion of the Armenian Church in Syria. According to the Catholicos, it was a specifically planned crime aimed against the Church that was dedicated to the memory of the victims of the Armenian Genocide as well as against the museum affiliated with the church. “We view this atrocity, committed in the run-up to the Armenian Genocide centennial and on the 23rd anniversary of Armenia’s independence, as an act of barbarism. Many of those standing behind this plot know that Deir ez-Zor, which symbolizes our martyrs’ memory and our nation’s struggle for justice, will never be destroyed as a sacred place in our nation’s collective memory,” reads Aram I’s post. The act was also strongly condemned by the Armenian Foreign Ministry, as well as by American congressmen. Earlier, U.S. ambassador-designate to Armenia Richard Mills said during a Senate Foreign Relation Committee confirmation hearing that “the United States and the world will stand in solidarity with the Armenian people next year to mark the centenary of one of the 20th century’s worst atrocities.” At the same time, U.S. ambassador-designate to Turkey John Bass, who was confirmed in this post later, said that respect for the rights of ethnic and religious communities in Turkey, including the restoration of the right of ownership of religious property, was a major priority for him as a representative of the United States. He answered questions from Senator Mark Kirk that were connected with the policies of the United States with regard to the Armenian Genocide and the return by Turkey of the confiscated property of the Armenian, Greek and Assyrian churches. Bass acknowledged that the Turkish government “in the period from 1936 to 2011 confiscated thousands of units of property belonging to Christian and Jewish religious institutions”. He listed several specific steps that he said he was ready to take to help ensure their return. Meanwhile, President Serzh Sargsyan is in the United States to participate in the UN General Assembly session. In his speech, the Armenian leader is likely to address Turkey’s responsibility and call upon the international community to support the Armenian demands.